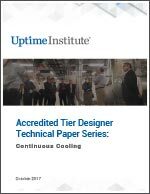 Abstract - This technical paper clarifies the requirements for Continuous Cooling in the context of the Uptime Institute’s Tier Standard: Topology. Tier IV is the only Tier that requires Continuous Cooling. Additionally, this paper serves to recommend Continuous Cooling at densities beyond 4 kilowatts (kW)/rack, regardless of Tier.